Help Vote Us Up On PlanetMinecraft! Personally I think that the black text on signs is hard to read sometimes. Today I added a plugin that allows anyone to color the text on the signs they create. It is really simple to use, and I added the instructions to the Server Guide under a new Advanced section. You can now click on residences in Town to see the address and who owns it. Residences waiting to be claimed will now show in blue on the Town map. 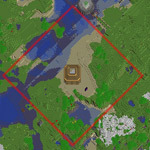 There is now a red border around the protected spawn area on the Wasteland and Nether. You can now follow a player on the map by clicking their little avatar photo in the right players list. Following a player keeps the map centered on them. Lawsuit settlement negotiation may soon become a spectator sport. In response to a trademark complaint from Bethesda Softworks, Minecraft creator Notch is suggesting an unorthodox way of settling the dispute. In a post on his blog, Markus "Notch" Persson has proposed a decisive game of Quake 3 to put the litigation to rest. "I challenge Bethesda to a game of Quake 3," Persson said. "Three of our best warriors against three of your best warriors. We select one level, you select the other, we randomize the order. 20 minute matches, highest total frag count per team across both levels wins." If Persson's team wins, The Elder Scrolls developer would have to drop its lawsuit claiming that the indie developer's next game, Scrolls, infringes on its own trademark. If Bethesda wins, Persson would agree to change the name of Scrolls to a Bethesda-approved title. In either case, Persson would be willing to put a disclaimer in his game noting that it is not related to The Elder Scrolls series in any way. It was a very long evening but the new server is up and the Empire has been transferred to it. If you cannot connect it may be that the DNS has not fully propagated yet. As a temporary solution you can connect to play2.empireminecraft.com (map2 if you are having trouble loading the map) . Please let me know if you find any issues. A few people (including myself) have been wanting an easier way for moving around Town. I have added a few new chat commands that allows you to teleport around town. These new commands will only work in town. Because of the new commands I will be getting rid of the yellow "Teleport to spawn" boxes in Town. Click here to view the new commands in the Server Guide. Hello to the Empire! Today I applied some updates to the server. Most of them you will not notice (plugin upgrades, performance fixes, etc). One thing that is noticeable is changes to the Live Map. First off we have switched from Google Maps to Leaflet as a performance enhancement (made by the map plugin developers). Second change is that the Town map is now "HD", later when we upgrade servers again I will make all the worlds have HD maps (and possibly being able to rotate the viewing angle). I am also working on (not done yet) the ability to see who owns what residence on the town map. Minecraft creator Markus "Notch" Persson likes to take things slow -- crawl before you walk, beta for two years and gain mainstream popularity and 3 million users before you release the actual game, that sort of slow. It seems Minecraft's release on XBLA won't be any different, as it will begin with a beta, much like its PC papi. Notch said he wants to discern which aspects of the game are fun on console before its release, but he thinks the Kinect features will be an interesting part of Minecraft's port, in an interview with Develop. Notch didn't say how long the full-game beta will last, but did add that updates will probably be infrequent and mods will not be available on XBLA at launch, for fear of breaking the system.